Oklahoma State alums accomplished many of the firsts for African Americans in wrestling. With Martin Luther King day on Monday I thought it’d be interesting to take a look at some of the significant marks that have been set in the sport of wrestling by Oklahoma State wrestlers. Naturally with the incredible legacy in the sport that OSU has, it’s been the program that’s set many of the firsts in the sport for African Americans. Joe James was the first African American to wrestle at Oklahoma State University. He was the first African-American wrestler to win a Big 8 title. James also won a Pan-American gold medal in 1963. Douglas, arguably, was a part of more significant moments for African Americans in wrestling than any other coach or athlete. Prior to arriving at Oklahoma State, Douglas became the first African-American to win a wrestling state title in Ohio. In 1964, along with two others, he became one of the first black males to wrestle in the Olympics. In 1966 he became the first African American to win a silver medal at the World Championships. He was also the first African American to captain an Olympic wrestling team in 1968. After finishing his career as a competitor, Douglas went on to an incredibly successful coaching career. As coach of the 1988 Arizona State Sun Devils he was the first African-American coach to lead a team to a Division I title. He won another in 1992 and was also the head freestyle coach for the 1992 Olympic team, another first for an African American. He then went on to Iowa State where he was notably the head coach of Cael Sanderson, the first undefeated four-time NCAA Champion. Jackson was the first African American to win three NCAA titles in wrestling. He won his third in 1978 alongside Lee Kemp who won his third the same year. That same year, in one of the most legendary nights in Gallagher-Iba history, he picked up a fall that blew the roof off Gallagher-Iba Arena and secured a Big 8 title for the Cowboys. 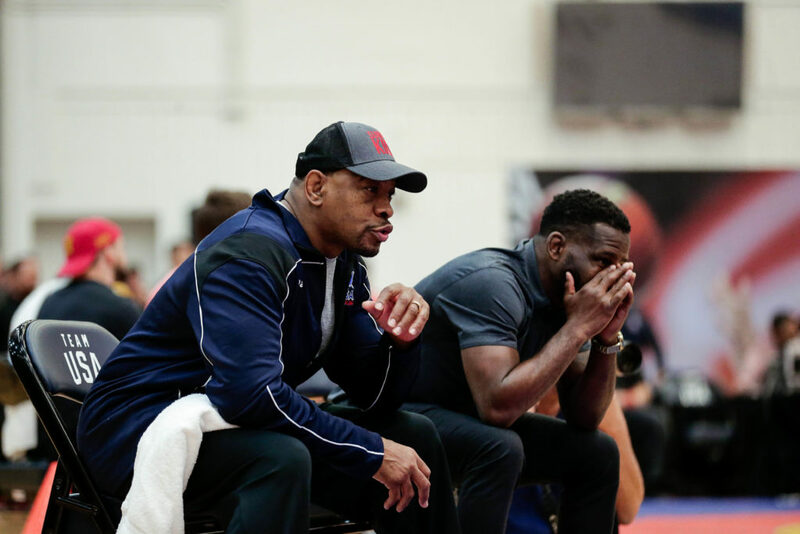 In the same year that Bobby Douglas became the first African American coach to win an NCAA team title, Kenny Monday became the first African American to win an Olympic gold medal in wrestling. Monday was a three-time All-American at OSU, a three-time NCAA finalist and NCAA champ. At this point Daniel Cormier is not only accomplishing firsts for African Americans in MMA. He’s really just setting records across the board and is cementing himself as arguably the greatest MMA fighter of all time. He became the second fighter ever to hold UFC titles in two divisions at the same time and the first African American to do so. He is also the only fighter ever to hold two titles at the same time and to successfully defend one of those titles.